Long, sinuous, and faint finger-like ring structures, dubbed 'tendril' and seen by NASA’s Cassini spacecraft in the vicinity of Saturn’s moon Enceladus, have their origins in the geysers erupting from the moon’s south polar region. Apr 14, 2015: Tendril-producing Geysers on Enceladus' South Polar Terrain - This graphic plots the source locations of the geysers scientists have located on Enceladus' south polar terrain. 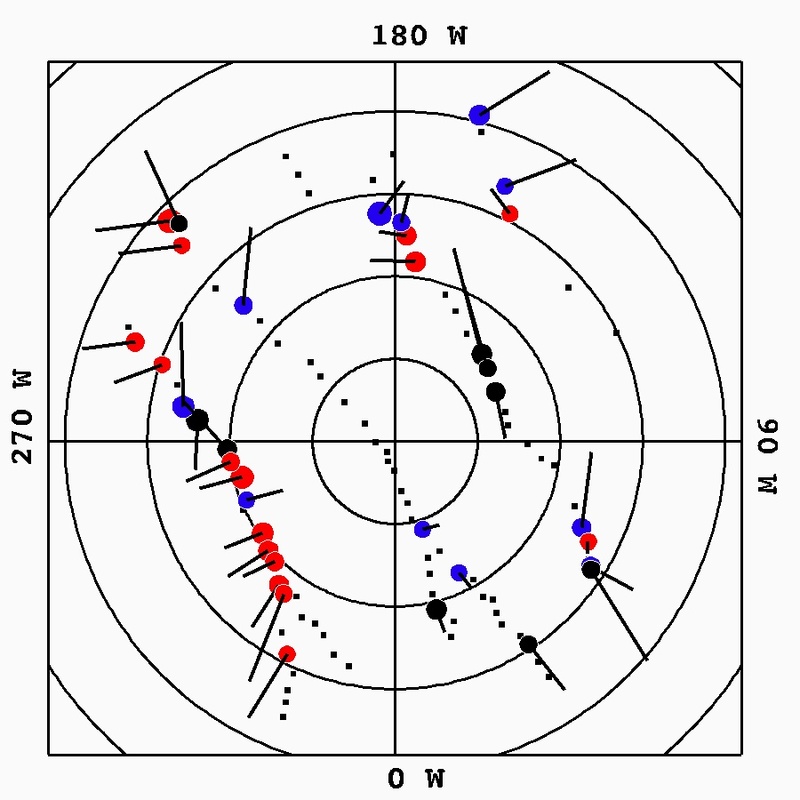 The 36 most active geyser, or jet, sources are marked by circles and color coded by the behavior of the grains erupting from the geysers. Other, less active sources are marked by small black squares. 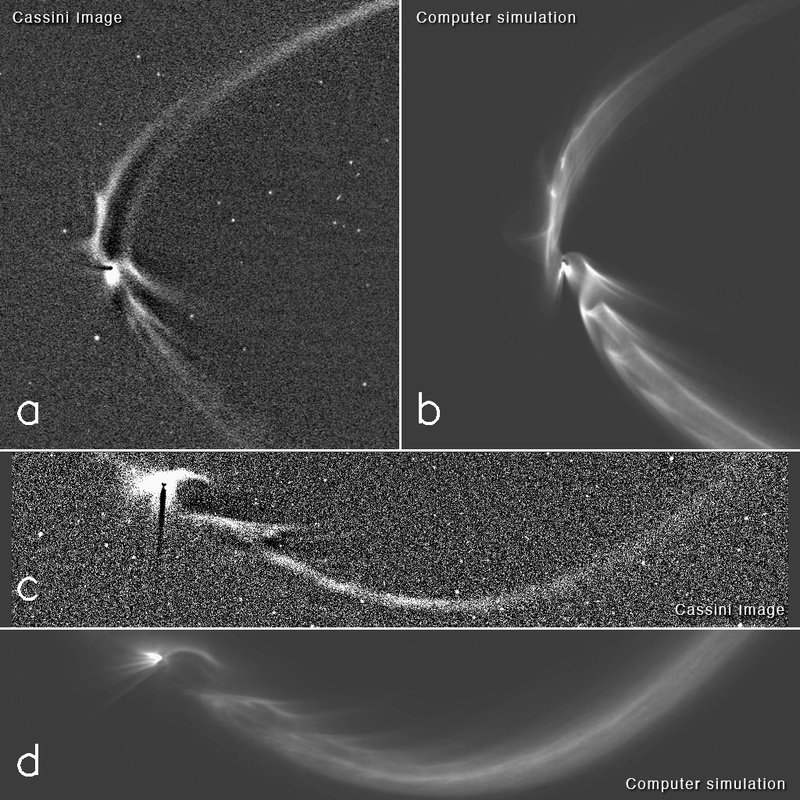 Apr 14, 2015: Simulations of the Tendrils - This collage, consisting of two Cassini images of long, sinuous, tendril-like features from Saturn's moon Enceladus and two corresponding computer simulations of the same features, illustrates how well the structures, and the sizes of the particles composing them, can be modeled by tracing the trajectories of tiny, icy grains ejected from Enceladus' south polar geysers. Apr 14, 2015: Earliest Tendrils - This was the first image in which the Tendril structures were visible near Enceladus.